Counterfeit M.U.S.C.L.E. figures. It often seems like M.U.S.C.L.E. collectors fall into one of two categories: (1) deep, passionate enthusiasts; or (2) utterly unemotional. The latter is not bad – they simply don’t care one way or the other. But for the former category it can be intoxicating. 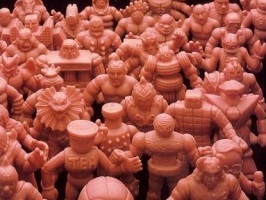 Counterfeit M.U.S.C.L.E. figures have so many sub-categories – so many colors, textures, copyrights, changes, and even brands. The lovingly terribly named Frankenstein-Like Amalgam Figures (FLAF’s) are one of those interesting sub-categories. They are counterfeit figures that have been slightly modified. Up until this point most collectors were pleasantly surprised to find a new sculpt or different color. However, there may actually be two distinct types of FLAF’s. The first type is a harder, almost resin-like version. It isn’t breakable like resin, but the plastic has a very brittle feeling stiffness. Mini-figure collectors sometimes talk about the “feel” of the figure. The feel of the harder versions are not very satisfying. The second type of FLAF figure is much softer. 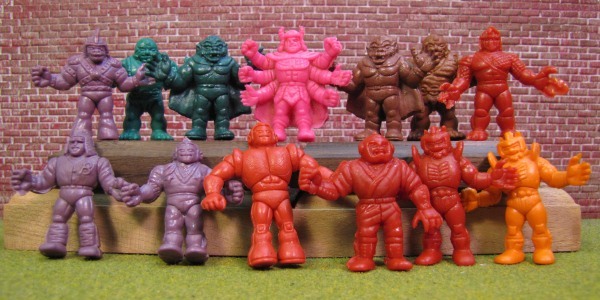 In fact, the softer versions almost seem like a perfect balance of original keshi eraser and M.U.S.C.L.E. plastic. The figures are firm, but flexible. And not so flexible that it feels as if they may tear. This information has been added to Frankenstein-like Amalgam figures section of Art 100. Individual pictures of the FLAF’s will be added to the visual archive soon. If you have FLAF’s you’d like to add to the visual archive, then please email pictures to UofMUSCLE@gmail.com. This entry was posted on Tuesday, March 11th, 2014 and is filed under Art, Research, UofM News. You can follow any responses to this entry through RSS 2.0. You can skip to the end and leave a response. Pinging is currently not allowed.